We’ve been noticing something the past few months: Every tech company is trying to be more like Microsoft. Which is to say, they’re belatedly copying the Surface Pro, a laptop/tablet mashup that’s already in its fourth generation. There are different examples: the iPad Pro from Apple, Google’s Pixel C, as well as offerings from Lenovo and Dell. 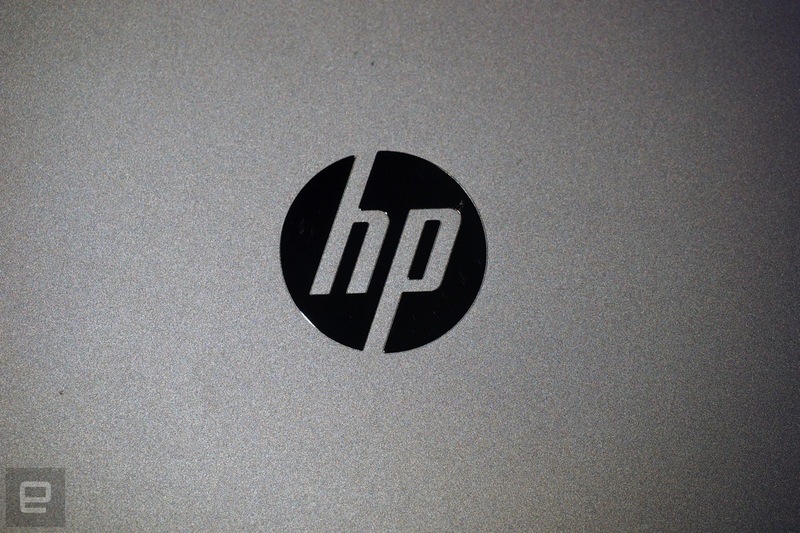 But HP’s latest is an especially literal interpretation. 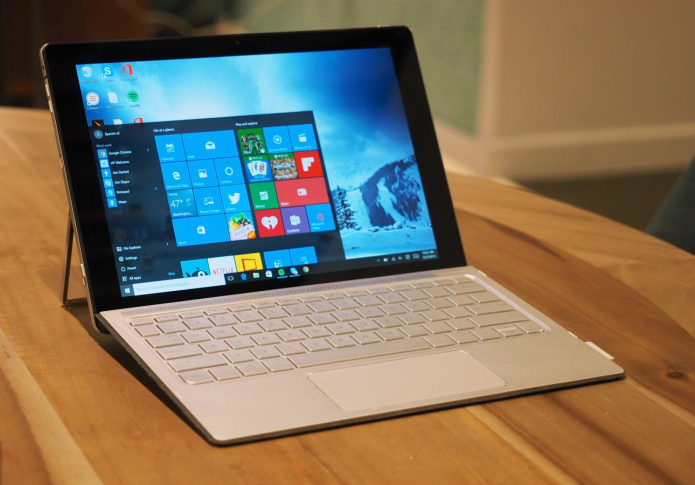 The Spectre x2, as it’s called, is a 12-inch Windows tablet with a keyboard cover. 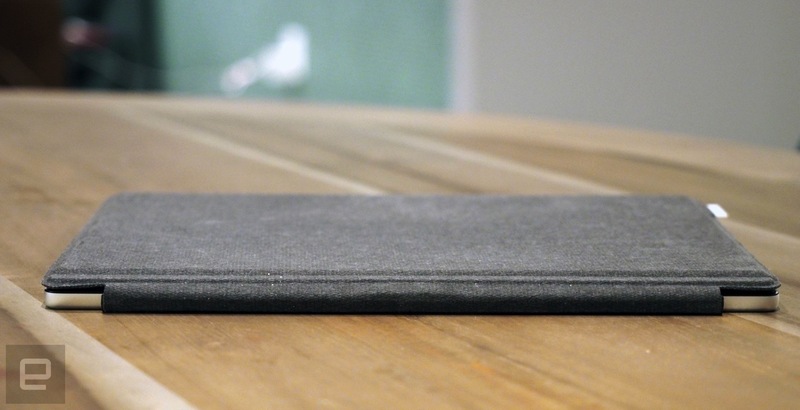 Also like the Surface Pro, it sports a kickstand around back and can be used with a pressure-sensitive pen. But, it’s cheaper and the keyboard actually comes in the box (hear that, Microsoft?). On paper, then, it would seem that while the x2 isn’t groundbreaking, it could be worthwhile in its own right. The Spectre x2 undercuts its competitors with a lower price that includes a keyboard in the box (and it’s a very comfortable keyboard, at that). Still, for more money you could buy a similar product with faster performance, longer battery life and a sharper screen. That means the x2 is a good deal for the money, but not the best in its class. It works like a Surface, but it doesn’t look like one. 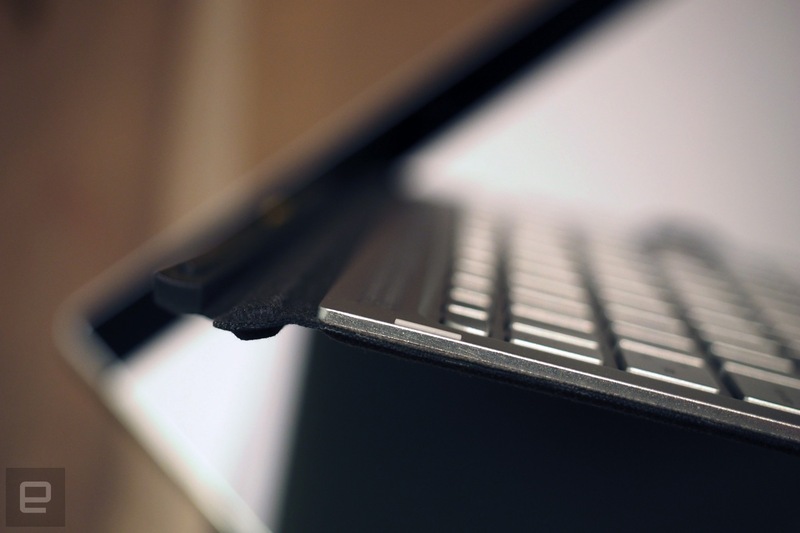 Whereas the Surface Pro is all chamfered edges and unibody metal, the Spectre x2 is marked by rounded corners, exposed screws and some chrome and glass bits. Let’s start our tour on the backside for once, because that’s where most of the action is. 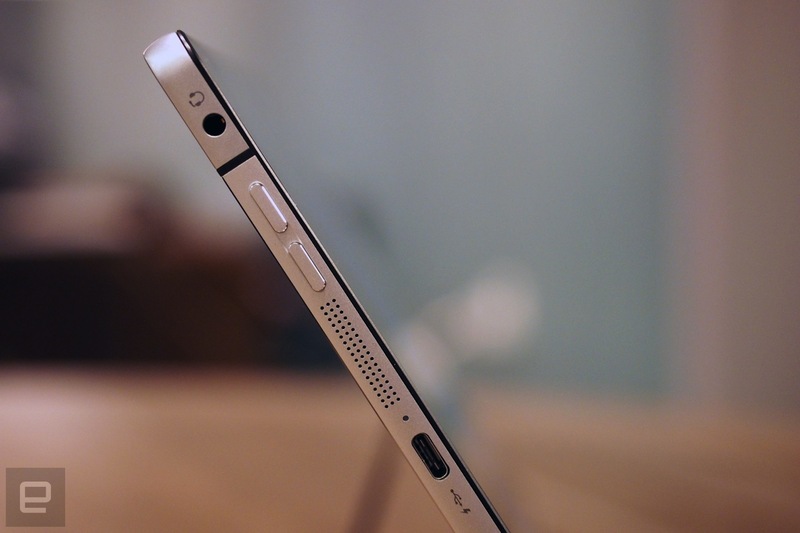 The all-important kickstand sits flush with the rear case until you hold down a release lever on the left side. When extended, it looks like an easel, with an open metal frame that stays put on flat surfaces, but isn’t always comfortable to balance on your lap. I also find it’s slightly more cumbersome to pull out than the Surface’s kickstand, though both are a bit awkward in that respect. 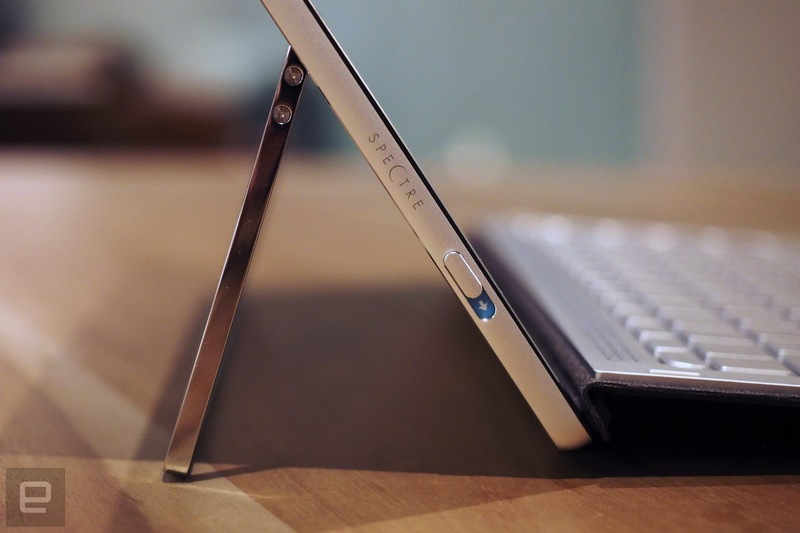 On the plus side, the kickstand is fully adjustable (also like the Surface Pro), which not all hybrids are. 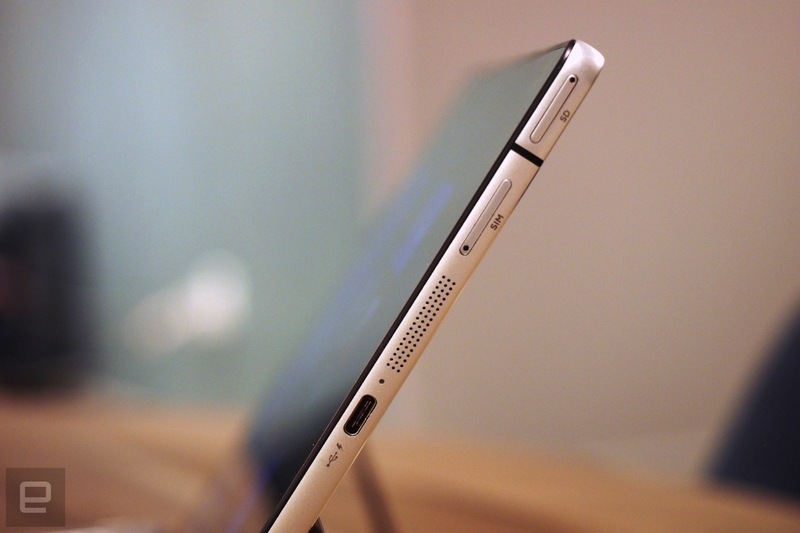 Also on the rear, you’ll find a black glass strip lining the top edge. That’s where HP places Intel’s 3D RealSense camera setup, which is composed of a main 8-megapixel shooter and stereoscopic 720p cameras for capturing different layers of depth information. As we’ve found in other productsusing the technology, it can be fun to take photos and then adjust the focus after the fact, as well as apply filters to selective parts of the picture. 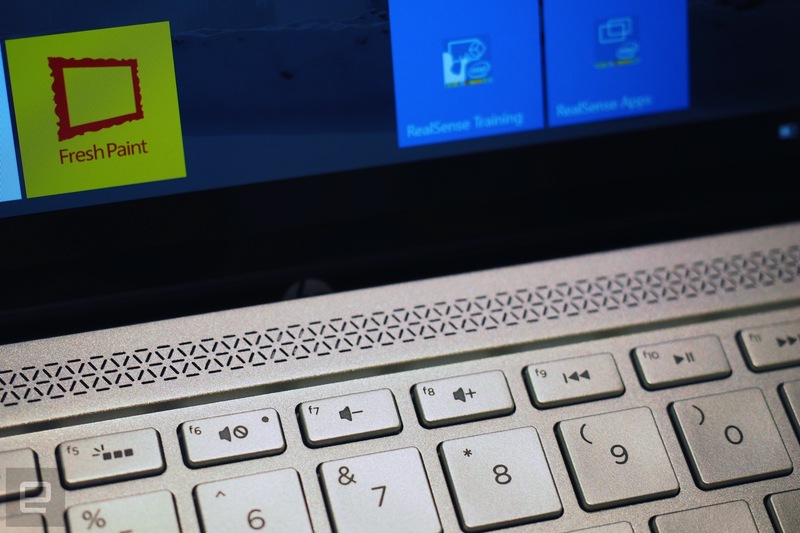 Unfortunately, while RealSense devices are in theory able to take advantage of the Windows Hello biometric log-in in Windows 10, the fact that these depth-sensing cameras are on the back of the x2 means they won’t be of any use for things like facial or iris recognition when you want to quickly sign in to your machine. Also, it’s a little awkward using a 12-inch, nearly 1.9-pound tablet to frame shots. Speaking of the sort, the x2 is thin and light in the grand scheme of things — i.e., compared to full-fledged laptops — but it’s not remarkably small either. All told, it comes in at 840 grams (1.85 pounds) and 8mm (0.31 inch) thick. That makes it easy to carry indeed, though the keyboard cover adds quite a bit of weight, bringing the total to 2.68 pounds. 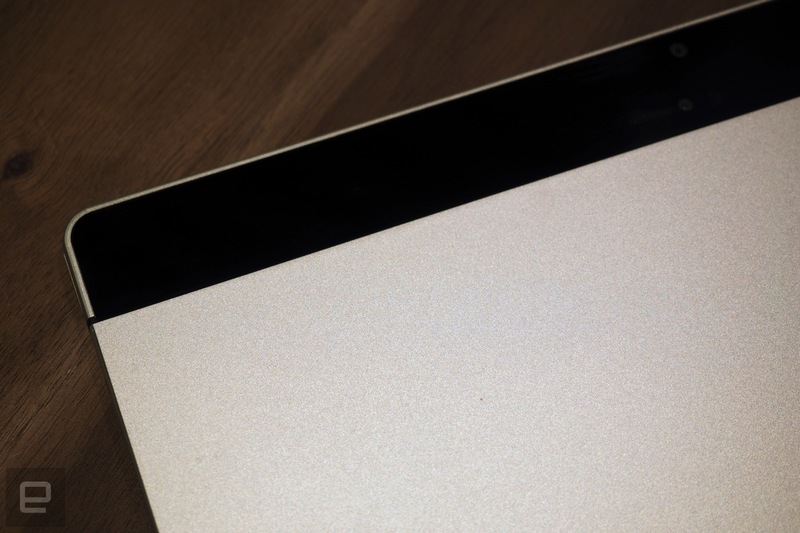 Meanwhile, the Surface Pro 4 starts at 1.69 pounds, with the optional Type Cover adding just 0.64 pounds. Need some more examples? 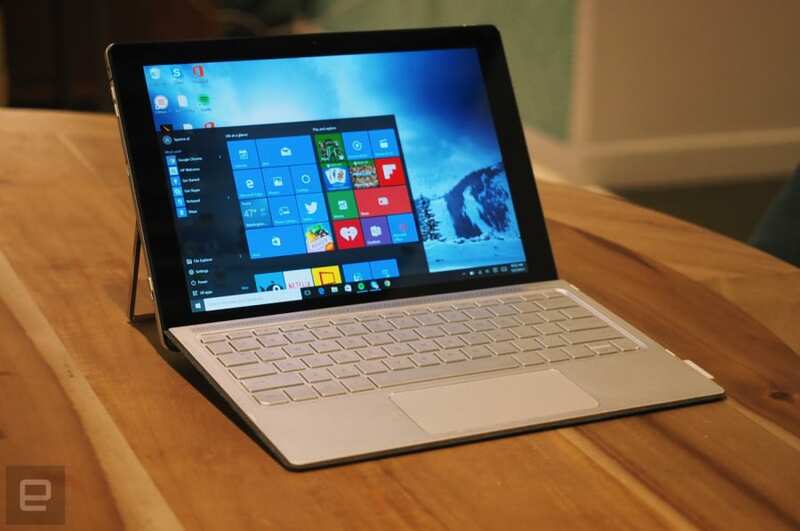 The tablet portion of theSurface Book weighs 1.6 pounds with a more powerful Core i5 or i7 processor, while the 12.9-inch iPad Pro starts at 1.57 pounds and measures 0.27 inch thick, despite having a larger screen than the x2. If it sounds like I’m splitting hairs, I have a point. One of the main reasons to use Core M, ostensibly, is that you can achieve thinner and lighter designs than you could with a heavier-duty Core i processor. Or, at least, that was the case last year when the first Core M PCs started hitting the market. Now, though, there’s no real benefit, at least in terms of size and weight. As you’ll see, too, Core i systems still have a leg up when it comes to both battery life and raw performance power. That leaves just one reason to get a Core M system, then, and that’s price. Before I get too far ahead of myself, though, let me finish up my tour of the tablet. 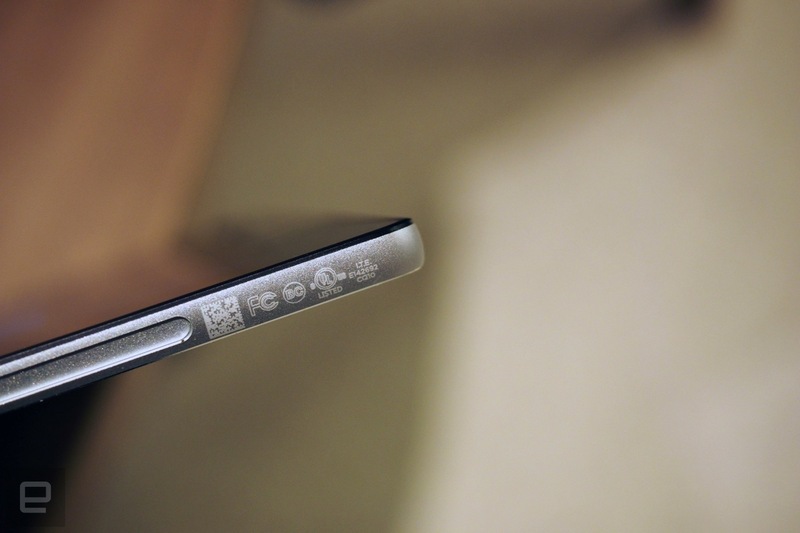 The all-important power/lock button sits on the top edge, with separate pin-locked microSD and SIM trays on the right. Also on the right is one of two USB Type-C ports that you can use to charge the device. Google’s latest Pixel Chromebook also had two USB-C charging ports and while it’s not what I’d call a necessity, it’s nice to be able to choose which side you’d like to have the charging cord to come out of, depending on where you’re sitting relative to the nearest outlet. Should you need a full-sized USB Type-A connection, there’s a dongle included in the box, something other hardware makers don’t bother to offer. At the center of everything is the 12-inch IPS display. The resolution is capped at 1,920 x 1,080, which is lower than some competing products, including both the Surface Pro 4 and iPad Pro. Still, on a screen this small, the difference would be subtle at best, so in the interest of keeping the cost down, this was a fine compromise. Even if the screen angle weren’t adjustable, which thankfully it is, I would have had an easy time making out the screen. As a warning, the glossy panel doesn’t completely repel glare, but color and contrast at least stays mostly consistent as you tilt the screen forward and back. Lastly, the x2 is compatible with pressure-sensitive Wacom pens — that’s the same technology that the Surface Pro used to have before Microsoftbought Wacom competitor N-Trig. All of which is to say: The x2 will make a good pen tablet for drawing and note-taking, so long as you’re willing to buy your own writing implement. HP sells an active pen on its site for $30, though any Wacom pen using the same technology will do. The Spectre x2 might be slower than the competition, and the battery life might not be as long, and the screen might not be as sharp, but damn if it doesn’t have one of the best keyboards I’ve seen on a device like this. The metal keyboard feels sturdy, for starters, which goes a long way toward making it comfortable to use in the lap. It’s backlit — another plus. And, perhaps most importantly, the keys are generously sized with an impressive 1.5mm of travel, making them uncommonly cushy for a product in this class. 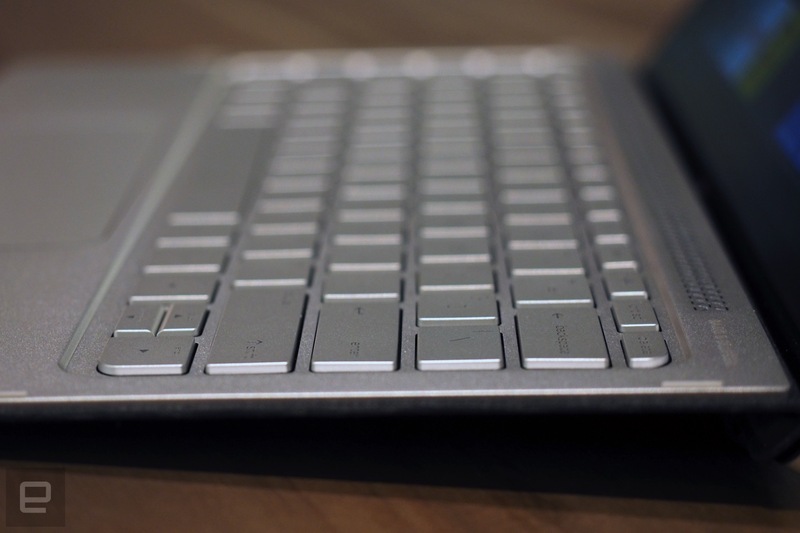 Also, I like how HP gives you a choice of resting the keyboard flat against your desk (or lap), or instead folding up the top to attach to magnets inside the tablet’s lower bezel. This gives the keyboard a lift in the back that for some will translate to a more ergonomically sound experience. Too bad the touchpad isn’t nearly as refined. To be fair, when it works it works well, with smooth enough scrolling and precise cursor tracking. But it doesn’t always work. I wasn’t always able to get the pointer to go, and I frequently found myself accidentally rearranging pinned browser tabs. Worse, there were times when I swiped my finger across the large touch surface only to find that it wasn’t responding. Usually, a little persistence would do the trick, as would detaching and then reattaching the tablet. But it shouldn’t be that way. Fortunately, I think this is just the sort of problem a firmware update can fix. The Spectre x2 comes with your choice of Core M3, M5 or M7 processor. It’s the same idea as Core i3, i5 and i7, except that Intel Core M sacrifices speed for the sake of achieving especially thin and light designs, like the one we have here. The unit I tested was a top-of-the-line configuration, with a dual-core 1.2GHz Core M7-6Y75 processor, Intel HD 515 graphics and 8GB of memory. Even with the best specs offered, benchmark scores still trail new machines with Core i5 chips, including the Surface Pro 4. In particular, you’ll notice a big gap in graphics-focused tests, like 3DMark. To its credit, the LiteOn solid-state drive delivered max write speeds of 554 MB/s in ATTO’s disk test, which is in line with many other SSDs we’ve tested recently. Even so, though, it takes the Spectre x2 about 15 seconds to boot into the desktop, whereas it might take a faster machine around 10. Also, write speeds topped out at an average 281 MB/s, which trails many of its contemporaries, including the SP4, which gets into the 500-megabyte-per-second territory in write tests. 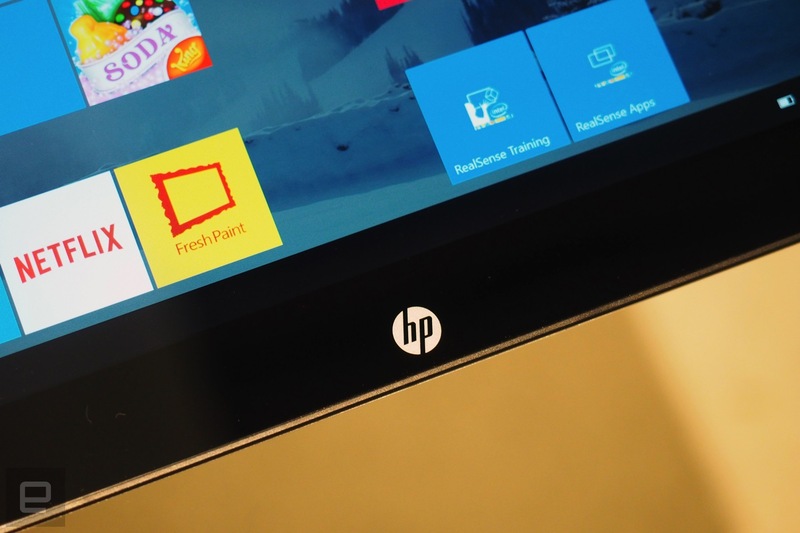 HP rates the Spectre x2 for 10 hours of battery life. If they say so. Perhaps it’s possible to achieve 10 hours of use if you lower the brightness to a fairly dim setting and use the machine intermittently. For my part, I never came close to reaching that milestone. With an HD video looping and the brightness fixed at 65 percent, the x2 managed six hours and 43 minutes. And it seems we’re not alone: Our friends at Laptop Mag, for instance, got around six and a half hours in what’s arguably a less taxing test. All told, between the performance and battery life results, I’m convinced there’s not much reason at this point to buy a device with Intel Core M, especially if you have a choice. 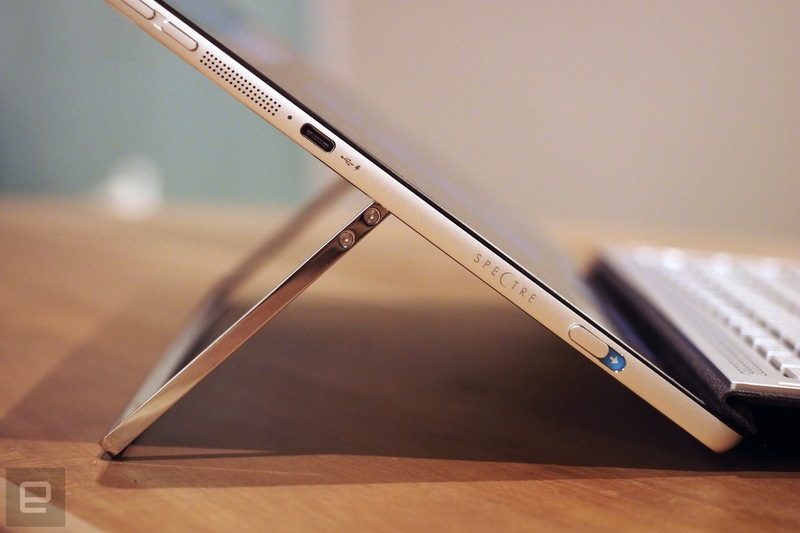 Yes, it enables super slim designs, but so do the latest “Core i” processors. Core-i chips also offer faster performance, and early reviews suggest that battery life is longer too, especially compared to last year’s Core CPUs. The only benefit to Core M seems to be that those models are slightly cheaper price your typical Core i5 system. But if you intend to own your next computer for several years, that extra $100 or so is well worth it. The Spectre x2 starts at $800 with an Intel Core M3-6Y30 processor, Intel HD 515 graphics, 4GB of RAM and a 128GB SSD. From there, you can upgrade to a $950 configuration with a Core M5-6Y54 chip and 8GB of memory. That model is customizable, too, allowing you to swap in a Core M7 CPU ($50) and either a 256GB ($150) or 512GB ($450) SSD. Either way, the keyboard comes standard in the box, and the 12-inch screen has a fixed resolution of 1,920 x 1,080. Or you could not buy an x2 at all. There are plenty of similar-looking tablet hybrids out there, including the one that started the trend: Microsoft’s Surface Pro 4. 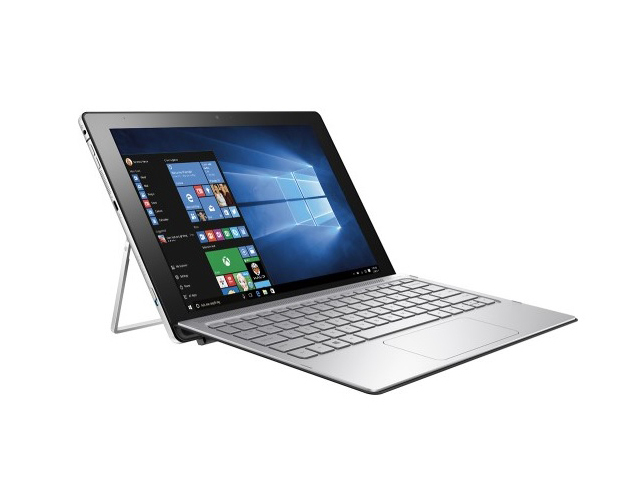 If you were to compare the two based on price alone, the SP4 would seem like the worse deal: With a higher starting price of $899, it has the same key specs as the $800 Spectre x2, and doesn’t come with a keyboard in the box (you’ll need to buy that separately for $130). Price aside, though, it’s still the better product. It’s lighter (1.69 pounds, versus 1.85); it’s more comfortable to use in the lap; it offers more powerful spec options; and the battery life is slightly longer, even with a more pixel dense display. Of the two, the Surface Pro 4 is the one I’d sooner recommend to my family and friends. There are others. Lenovo will soon begin selling the Miix 700, and Dell recently released the XPS 12, a 12-inch Windows tablet with an accompanying keyboard dock. Since I haven’t had a chance to test this one yet, I can’t vouch for the performance, though it’s worth noting that it runs on Core M chips, just like the x2, which means you shouldn’t expect particularly fast performance. I’m also curious to see what effect the 4K screen option has on battery life. The other thing I can’t account for is ergonomics. We already know that the 12.5-inch tablet has a fixed position inside its dock; that puts it at a disadvantage against the Spectre X2 and SP4, both of which have fully adjustable kickstands. On the other hand, perhaps the lack of a kickstand will make it more comfortable to use in the lap. We’ll see. And lastly, what kind of reviewer would I be if I didn’t compare the Spectre x2 to the iPad Pro? It, too, is a pen-enabled tablet designed to be used as a laptop on occasion, and it starts at a similar price of $799. The performance is fast, the battery life is longer than on the Spectre x2 and the pressure-sensitive Apple Pencil works well. But, iOS 9 isn’t as robust a multitasker as OS X or Windows 10; none of the optional keyboard docks allow you to adjust the screen angle; and the fact that iOS 9 has no mouse support can get tiresome, depending on what you’re doing. It’s a worthy product in some ways, but I only recommend it in its current form to creative pros and early adopters. In this increasingly big world of laptop/tablet hybrids, the Spectre x2 isn’t a bad choice, especially at this price. But that doesn’t mean it’s the best. The x2 is not the fastest, the longest-lasting or the most comfortable to use in the lap. It’s screen is not the sharpest. But it’s keyboard is arguably the easiest to type on of any click-in dock I’ve seen, and the audio is surprisingly decent. If money is no object, you will probably be happier with the Surface Pro 4. But, if you were hoping to avoid spending $930 just for the entry-level SP4 and keyboard, the x2 is a fine runner-up.